CircuitLogix is a software program that converts your personal computer into a fully-functioning electronics laboratory with thousands of components and devices that are easily interconnected. 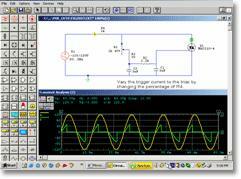 CircuitLogix electronics lab simulation provides fast, powerful schematic design and simulation in one complete program. It gives you the flexibility to design and test electronic circuits, trying all the "what if" scenarios without ever worrying about faulty parts or bad connections. CircuitLogix supports analog, digital and mixed-signal circuits, and its proven SPICE simulation gives accurate real-world results you can trust. The student version of CircuitLogix costs just $39 and is available as a free 15-Day Trial download for anyone who is studying electronics. Circuit files to accompany the major electronics textbooks used in colleges and universities are also included for students. So, as a student, you have access to both the simulation software and hundreds of pre-built electronic circuits. CircuitLogix Student Version is intended strictly for use by students on their personal computer. The professional version of CircuitLogix can be used by schools, educational institutions, training organizations, etc. While the core products are the same, the professional version of CircuitLogix has additional models and other simulation and export features that are not in the student version. One of the main differences between the student and pro version is that the full version includes 3DLab, which is a virtual-reality lab environment for introductory-level circuits and experiments. There is no hardcopy documentation provided with the student version. However, a comprehensive online student resource center provides access to online documentation for all CircuitLogix users. The student version of CircuitLogix contains over 4000 device models, which is 1/3 of the devices available in CircuitLogix Pro. Student Version devices include semiconductors, displays, indicators, switches, digital primitives, digital ICs, linear ICs, transistors, FETs, optoisolators, photo diodes, regulators, references, SCRs, triacs, supplies, sources, relays, math devices, transmission lines, motors, etc. In addition, a full suite of virtual instruments are provided including oscilloscope, digital multimeter, Bode plotter, curve tracer, data sequencer, signal generator, logic analyzer, logic probe and logic pulser. CircuitLogix is the only electronics lab simulator designed specifically for the education market. Our free student version created a revolution in electronics laboratory simulation, and has made us the world-leader in the electronics education market. The highly intuitive graphic-user-interface provides easy operation, without sacrificing its powerful processing capabilities. CircuitLogix meets or exceeds the functionality of its leading competitors while providing a more user-friendly interface. In most cases, you'll find that CircuitLogix is easier to use and provides as many or more features than products costing up to 10 times as much as our professional version.